We believe giving folks the opportunity to connect with agriculture strengthens their understanding of the food system, their responsibility to this earth, & our human relationship with nature. We hope to open doors to future generations of citizens who care about farming and food by offering tours and field trips at Moon Dog Farms. Oh, and we want to have lots of fun. Whether you are a neighbor, new customer or complete stranger, we welcome you to the farm for a scheduled farm tour or during one of our volunteer days. Throughout the year, we will holler out with a need for many hands to accomplish a certain task. Often, it's weeding. Sometimes, we have one big project that needs a little boost from outside help. If you'd like to be aware of these Volunteer Days, subscribe to our newsletter or follow us on facebook. After we've received your email, Casey will contact you for further information and discuss specifics of scheduling. All visitors--both adults and children--are required to sign a liability waiver before visiting the farm. Due to our intense summers, field trips are best planned September--May. For privacy reasons, we do not publish our address on our website. When you've scheduled a farm visit or become aware of an advertised Volunteer Day, we share our address directly with those involved. Farmer Casey signs "flower" during a lesson on snapdragons with students from Goose Creek's Tri-County East Regional School for the Deaf. 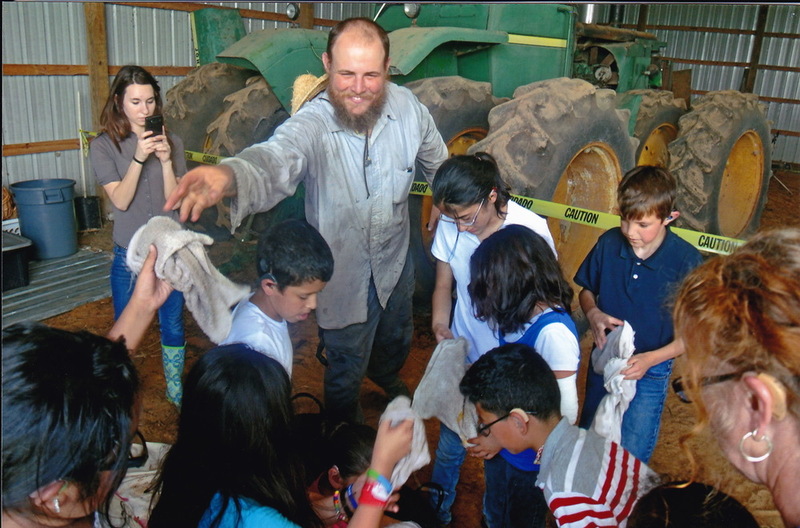 Farm field trips and tours are $10 per visitor, with a $70 minimum. Ages 3-10: there must be a minimum of 1 adult chaperone to 5 children. If you or your group would like to donate your time, we are happy to have ya! We encourage volunteers ages 15 and above. Email Casey with the same information required for scheduling field trips, listed above. Thank you for supporting your local farm!